After experiencing market movements like we’ve recently witnessed with our Relaxing Retirement members over the last 25 years, I know just how troubling all of this bad news is to deal with, especially when you’re at the stage in your life where you’re dependent on the money you’ve saved to support you, as opposed to relying on the income from the work you do. I know how challenging it is to remain confident when the overwhelming majority of voices you hear are delivering sour reports and forecasts. It’s not easy, and it’s not fun. Back in the financial crisis of 2008-2009, one of our Relaxing Retirement members asked me in passing how I personally deal with problems, crises, challenges, etc. It’s a very good question that led to an extremely valuable discussion which I’d like to share with you given our current climate as I believe it will really help you. Before I reveal this to you, I want to alert you ahead of time that there are both psychological and practical strategies in what in what I recommend for you. I will say ahead of time that I recognize this may appear to delve deeper than necessary (an expanded Retirement Coach Strategy! ), and that I run the risk of having you gloss over it. However, I believe you have to first understand the way the human brain works. I assure you that understanding this is critical to your progress in these difficult times. Studies have shown that the human brain is broken down into three sections: reptilian (back), mammalian (center), and frontal. The two critical points of understanding for the purpose of our conversation are that the reptilian portion of our brain is our most primitive in that its response mechanism is dictated by “primal instincts”. Essentially, it’s where our “fight” or “flight” reactions come from when we’re faced with danger. By contrast, our frontal lobe is where all critical thinking takes place, i.e. reason, analysis, prioritizing, rational thought, etc. Now, what does this have to do with how I personally deal with challenges and what I recommend for you? The key point is that when we’re faced with a challenge (perceived danger) like we’re experiencing right now with the recent downturn in stock prices, our initial reaction stems from our reptilian primal instinct, i.e. ‘fight or flight’. To overcome this, we have to consciously move beyond this ‘primal instinct’. Our brain can only deal with specifics. Vague generalities, like what we’re fed every day by the financial media, do not help us obtain the clarity we need to make rational decisions, and, in turn, develop and maintain the confidence we need. Instead, these vague generalities only serve to paralyze us. Because of this, my reaction to all challenges is to de-emotionalize myself as quickly as possible in order to place it all in proper perspective. In other words, I don’t let the “reptilian” part of my brain dictate my response in a knee-jerk fashion. Instead, I consciously write out all of the “perceived” dangers, obstacles, and setbacks in specific detail on a sheet of paper. I then do whatever is necessary to quantify all of them as they apply to me and those around me so that I can make rational decisions and react with a well thought out plan. With current market and financial turmoil, negativity is pervasive. It’s everywhere. However, each of us has a choice. We can either engage in the ‘group think’ perpetuated by the media, or we can get specific about what’s really true in your life because your brain can really only deal with and act on specifics. The recently concluded 3rd quarter was the worst market performance since the 1st quarter of 2009. The challenge with all of this “information” is that it’s just a bunch of vague generalities. It’s useless in helping you make rational decisions in your own life. In contrast, here’s an “example” of meaningful specifics that would help you make rational decisions, and thus help you develop and maintain your level of confidence. The amount of income you receive from social security and your pensions is $5,000 per month. Your fixed monthly expenses (per your Lifestyle Cost Estimator™) are $6,000 including income taxes. Your discretionary expenses are $5,000 per month in order to live the way you want, including vacations and gifts for your grandchildren. Given this, you need $6,000 ($6,000 fixed plus $5,000 discretionary expenses minus $5,000 of fixed income) per month from your Retirement Bucket™ (your investments) in order to make up the difference. Your investment balances, after this market price correction, now total $1,800,000. You’re 68 years of age and want to plan for at least another 22 years until age 90. You’d prefer to live in your current home as long as possible, so you don’t want to “count” the equity in your home in your forecasts. If you had to, you would downsize at some point in your life, but would prefer not to ‘have’ to. The investment rate of return we determined that you needed to earn in order to continue your monthly withdrawals of $6,000 (plus a healthy 5% cost of living increase each year) was 4% back in April. Today, after six more months of withdrawals and the market’s impact on your investment values, you now need to earn 5%. Given these meaningful specifics, this example illustrates how you would now know exactly where you personally stand in relation to current financial conditions based on your own unique priorities and resources. This allows you (if you choose to engage in this line of thinking and exercise) to make rational decisions based on relevant facts instead of remaining paralyzed. It may not provide you with what you might interpret as “good” news. However, it does provide you with facts that you can make decisions with, such as how you choose to position your money from here forward, or how you choose to spend in the future. Reading the newspaper, turning on the television, and/or checking on-line throughout the day to see where the market is will not provide you with usable information with which you can act. It only further perpetuates a lack of confidence, and, in turn “paralysis”. Given the stage in life that you’re experiencing right now where the money you’ve accumulated over all these years must now support you, you have every right to be anxious and frustrated. However, as I just illustrated, you want to do everything you can to move forward so that you can continue to confidently live the way you want. Now for my question that I promised at the beginning: Does what you just read sound familiar? Did the Bernanke reference give it away? If so, it’s because this was my Strategy of the Week on October 11, 2011. As you read a little earlier, it came on the heels of a 20% market price correction, more than double what we’ve just experienced so far in the Fall of 2014. So, why did I present the exact same Strategy three years later? First, we’ve recently been flooded with sour market and financial news on a daily basis, and it can be a little unnerving because we haven’t experienced significant price declines in quite some time. 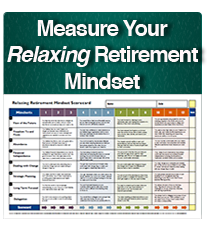 And, second, the Strategy I recommended back then has proven to be so effective for so many Relaxing Retirement members, that I strongly, strongly recommend implementing the exact same Strategy today!